The information below is what I personally do for the care of my rabbits and my own opinion. I have been raising bunnies for many years and have knowledge but I do not know everything. If you feel your bunny is in danger please call a rabbit vet asap. FEED: ﻿﻿ I feed my bunnies an unlimited amount of Manna Pro (Pro formula) available at Tractor Supply Stores in a 5lb bag which is perfect for one bunny. Another good brand is Nutrena or Purina. I do not feel the need to ration them if they stay in good weight. There is a Feed Store List Below to find a store near you. As long as you are not feeding feed from a pet store that has the added seeds and colored bits added to it then you will be ok. That food is terrible because the bunnies eat all the snack bits from it and not the pellet part which is where the nutrition is and they become skinny. Be sure to store your feed in an airtight container so it stays fresh, it changes color and becomes old fast, taking away the nutrients from the feed. Adults and babies eat the same feed their whole life, some companies say baby bunnies need special feed but that is just not true. When you bring your new bunny home from me, I will give you a baggie of my feed, mix it half and half with the feed that you buy (unless you get my brand) until it is gone to transfer them to your feed.﻿﻿ I DO NOT recommend OXBOW brand feed, they market baby bunny feed which they dont need and most do not like it. HAY: I feed my bunnies a good size handful of 2nd cutting orchard grass hay usually every other day. Rabbits MUST have hay in their diet at least a few times a week. Hay is necessary for the proper functioning of a rabbit's digestive system. It is similar to why humans need fiber in their diet. It also helps their teeth wear down a bit. You can feed timothy hay or orchard grass hay, NOT Alfalfa! Timothy hay and orchard grass look just like dried grass and are a light green, alfalfa is dark green, high in calcium and has been linked to kidney problems in bunnies. I recommend orchard grass hay. You can get hay at a feed store for a lot less than a pet store, usually they will fill up a feed sack of hay for a few bucks. You can never feed too much hay! Age does not matter for hay, babies and adults should always have hay a few times a week. If you live in Seattle area and have trouble finding hay or want delivered, visit HERE and order from Amazon- nice fresh hay for your bunnies. Also can order hay and quality rabbit feed and treats at www.bunnybytes.com and they are in WA so shipping is not too much and their hay is MUCH better than hay from a pet store, your bunny will appreciate it! Fruits/Veggies: Bunnies under 6 months old cannot have ANY fruits or veggies, it will give them diarrhea and they will dehydrate and it is the reason many babies die. The following is what I do for all bunnies OVER 6 months of age. I feed my bunnies a different fruit or veggie every other night. I usually give them a two inch thick slice of banana (no skin) twice a week or so, 1/2 a big carrot twice a week (a whole carrot is too much for this small of a breed of bunny), and some parsley or cilantro here and there. I also feed apples (no seeds)when they are on my trees. Some people feed a lot of fruits and veggies to their bunnies and this is fine as long as you keep doing it and gradually work them up to being able to have that much. Below is a list of good and bad bunny treats, the ones in bold are my bunnies favorites. DO NOT FEED BUNNIES UNDER 6 MONTHS OLD VEGETABLES OR ANY GREENS THEY WILL GET DIARRHEA!!! Treats: My bunnies do get yogurt drops and pet store treats every once in a while but not very often. Pet store treats are not very healthy for bunnies and they make them fat! If you must get them treats at the pet store then just do not give too many very often, giving them plain dry oatmeal on top of their feed a couple times a week is a much better treat. Holland lops are very small and do not need large quantities of anything so always feed treats in moderation. Exercise: It is true that bunnies need exercise but that does not mean that they have to come out of their cage constantly. As long as you have a big enough cage for them to run around in their cage and you give them toys such as wood blocks, apple branches (I cut them right off my tree), toilet paper tubes (cardboard is ok for them to eat), and most bunny toys at the pet store, your bunny should be happy in its cage for the day while you are gone. I have dog exercise pens in the grass for my bunnies to play in. On nice days they get to go out for a couple hours each. If you put your bunny out in the yard be sure it has shade and water! You can also get a bunny harness and leash to exercise your bunny. Make sure the harness is snug they can get out easy! And never leave the harness on when you are not supervising, they can hurt themselves. 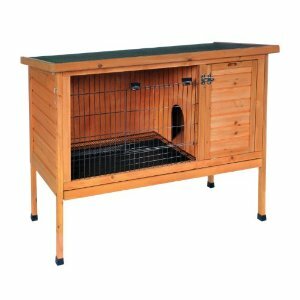 click HERE to make an easy outside playpen for your bunnies! https://www.kwcages.com/cages/house-rabbit-indoor-rabbit-cage.html Wire cages last for many years and there is nothing bunnies can eat on them! Most pet store cages are powder coated with paint which most bunnies will chew on the wire and they have plastic floors that they eat. They will eat wood cages and cedar can be toxic so don't use cedar if you are building your own. I do not like the cages without wire floors where the bunny is in shavings walking in its own feces, it makes a huge mess and the bunny smells a lot more. My cages are most all 24" X 30", a cage at least 24" X 24" is fine for a Holland lop. If you feel bad about them being on a wire floor you can put cardboard in there for them to lay on. I use horse stall pellets (natures bedding) from the feed store to absorb the pee in the trays but wood stove pellets from home depot work as well. I sprinkle a little in all 4 corners and clean the cages every week or so, can also use the pellets in litterboxes but make sure they are animal friendly wood pellets from the feed stores. Do NOT ever put any stuffed animals, towels or blankets in the cage, they will eat it and block their stomach off, has happened one too many times and if you want to give them something to lay on, put a piece of cardboard in there, they can eat it and when it gets dirty you can put a new piece in. Emerald City Emergency- Seattle, WA 206-634-9000 24 Hour Emergency Vet, They will help you! lots of other vets in area, they just charge a lot more. Just make sure that whatever vet you choose has experience with bunnies, as they are more fragile than other pets and surgery is always risky with bunnies. It is easier to litter box trained a fixed rabbit as well so it is a good idea. IF you get TWO bunnies, they both must be fixed when older or they will fight to death, so keep this in mind if you are wanting to get a couple. Worming: Worming bunnies is important because even if your bunny is an inside only bunny, they can get worms from the hay they eat. It is a preventative step and kills any parasites they may have. I worm my bunnies twice a year with horse wormer called Ivermectin paste. It comes in a tube at the feed store and is enough for a horse so it is best if you can just get a little bit from someone who has a horse. Just a small pea size amount smeared on their mouth will do it. They hate the taste so be prepared for them to kick and be mad..;) If you purchased your bunny from me I am more than happy to worm your bunny for you if you want to bring it by twice a year for $5 each time. Nail Trimming: It is important to trim your rabbits' nails every month or so. If their nails get too long it will cause them pain. I use cat nail trimmers found at a feed store or pet store. Just trim to within 1/4" of the red blood line in the nail. Be sure to have blood stopper on hand in case you cut too close, but don't let this discourage you from trimming. I usually sit in a chair and put the bunny upside down between my legs. I place a towel over the face/front feet while I trim the back feet and put it over the back feet when doing the front so I do not get kicked in the face. I can clip your bunny's nails for $5 if you want to bring it by. Should you wash your bunny? : Many people ask me this since their bunny's feet may be discolored from their cage and they want them clean. Bunnies clean themselves very well and they should never have a bath. To clean their feet just get a wet washcloth with some soap and scrub their feet and then dip them in clean water to rinse. It is very bad for bunnies to get wet, they get cold very easy and can get pneumonia. If for some reason you must wash your bunny, do not get their head or ears wet, and keep inside for 2 days because they stay cold for a long time after their bath. I do not recommend washing them. Bringing Bunny Home: The first few days, avoid holding your bunny too much, maybe once a day for 5-10 minutes. They get stressed very easily and can die from it. If they seem to be in the back of their cage, just let them stay there and get used to the new home. You can cover part of the cage so they can have a dark area. Avoid making too much noise around them also, their ears are very sensitive. Above are GOOD Examples of cages for bunnies, all wire with wire floor and slide out tray, try to get one like these at a feed store or order online-The wire DOES NOT hurt their feet and this kind keeps them so clean, can put a litterbox inside as well. I sometimes have ones like these for sale so just ask me when you email to inquire about a bunny. DO NOT get a solid bottom cage like the one below. These are for guinea pigs who have no fur on their feet and have to have solid floor. Bunnies have very thick fur on feet and wire does not hurt them. In this kind of cage you will have bunny going potty in entire cage and they run and bedding flies out everywhere. Very hard to clean and makes bunny dirty.